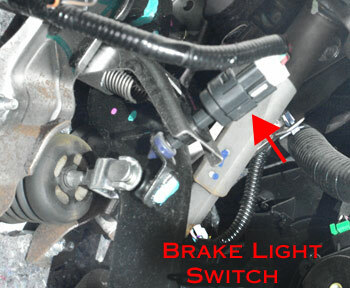 Brake light switch is a small device attached to the brake pedal mechanism. Despite its small size, the brake light switch plays an important role in a modern car. Brake light switch is installed above the brake pedal. Many vehicle systems including Push-Button start, Antilock Brakes and Vehicle Stability Control cannot operate if a brake light switch is not working properly. The brake light switch serves two major functions. First, it turns on the brake lights when a driver presses the brake pedal. Second, it sends the signal to the vehicle computer that brakes are applied. A car with a faulty brake light switch is UNSAFE to drive. In most cars, the brake light switch is installed right above the brake pedal. Inside, it has a one- or two-way electric switch. The most common symptom of a faulty brake light switch is when brake lights don't come on or stay on all the time. A faulty brake light switch can cause many problems. If a switch is bad, the brake lights won't operate and the transmission shifter will not come out of "Park" position. In cars with a push-button start system, a faulty brake light switch can cause the vehicle not to start. 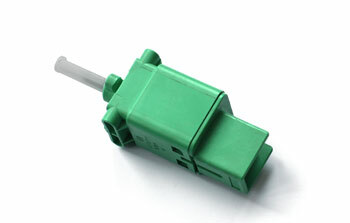 Often, a brake light switch might be sticking and work intermittently. This can cause the Check Engine or ABS system warning light to come on on the dash. In some cases, brake lights may stay on all the time, or come on randomly, without pressing the brake pedal. A brake light switch can be tested with a multimeter without removing it from a vehicle. In some cars, the testing procedure involves testing the voltage at the brake light switch connector when the brake pedal is depressed and released. In other cars, the service manual recommends testing the switch continuity with the pedal depressed and released. If there is no voltage at the brake switch, the fuse bight be blown. See how to check a fuse. In some cars, a brake light switch may contain a pair of switches inside. Both will need to be tested. See the service manual for your car for the correct procedure. In this post, we listed several links where you can get access to a factory service manual for a subscription fee. The part is not very expensive ($15-$45) and can be ordered from a dealer or online. The replacement of a brake light switch in a repair shop can cost from $55 to $115 (part and labor). In many cars, there is a special procedure to remove and install the brake light switch. If not installed correctly, the switch will not operate and can even be damaged. In some cars, the gap between the brake pedal and the switch must also be adjusted. If you plan to replace the brake light switch by yourself, find the correct replacement procedure for your car; Google is your friend. Timing belt: when to replace, what happens if it breaks.